It’s good to be back from Spring Break! I took last week off from blogging to spend that time relaxing with my two beloved kids. That was sheer bliss! On one lovely day last week I became highly aware of my senses. 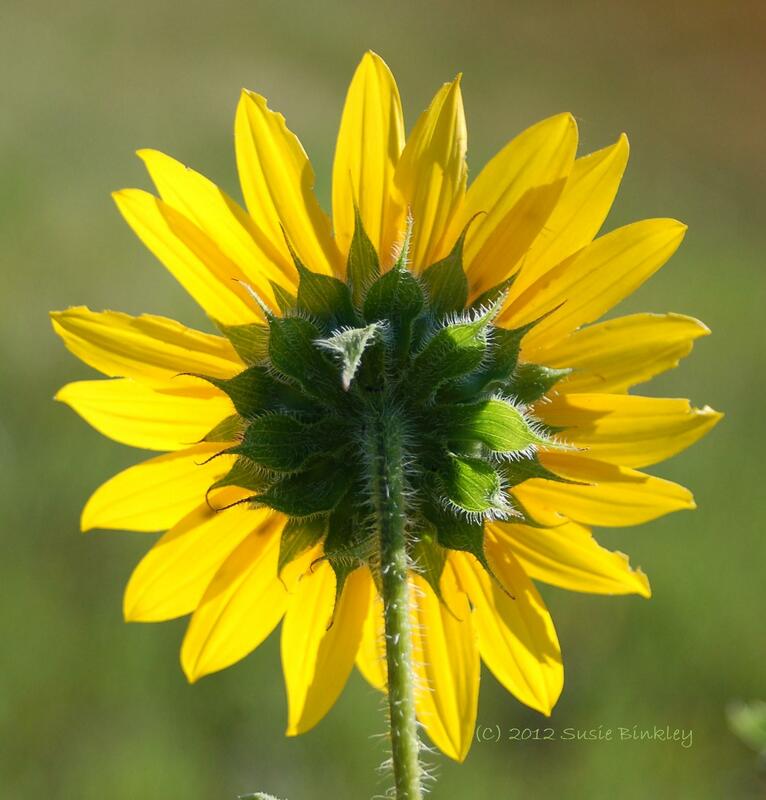 As a nature photographer, you might think that I rely mostly on my sense of sight. I’ll admit, it’s rather obviously primary, but I couldn’t do what I do without all of my other senses. Out on my nature hike one morning I came upon a flowering tree at the bottom of a hill. A fellow hiker had seen me taking macro shots of budding chokecherry bush leaves and suggested I continue down the hill if I wanted to see some cottontails frolicking along the fence. I thanked him and trotted down the hill, stopping to capture some nice shots of a pair of magpies who were building their nest and flapping about rather noisily. As I came to the bottom of the hill the path rounded a corner. The bunnies hopped away from the trail just as I arrived, escaping from some barking dogs and noisy people. I stopped and watched the rabbits while I let the people and their dogs pass by. And as they walked hurriedly on, chatting and barking away, I watched several groups of people move past me, some jogging to tunes on their ipods, some running the trails, some chasing after unruly children. Finally, they all moved on, and I was left alone with the bunnies. They hid under shady tree and sat down to recoup from their dog encounter. I just smiled. I took a deep breath, thankful that it was finally quiet and calm. But then, almost instantly, I turned my head. I caught the sound of… hmm… what was that? Buzzing! 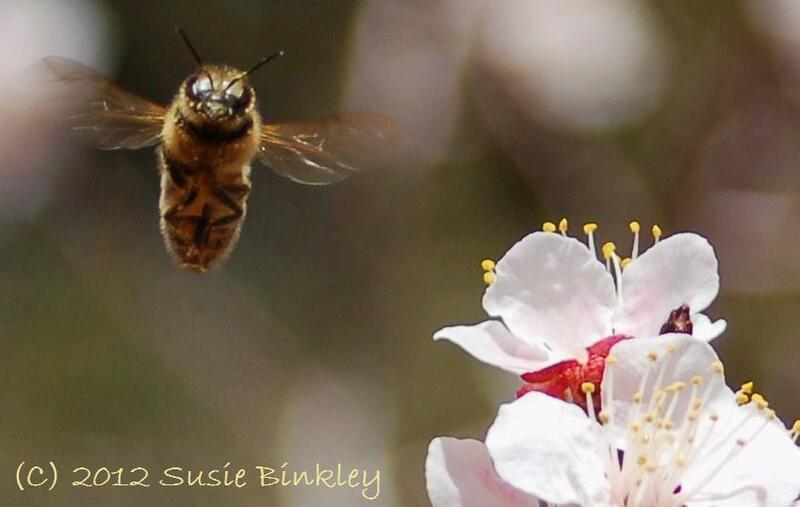 The sound of an entire chorus of bees filled my awareness and turned me around. The cacophonous noise grew louder as I turned to face it. Before me was a large tree exploding with beautiful spring blossoms. As my eyes focused, the tree seemed to move with the motion of the bees swarming it. In graceful peacefulness they went about their busy bee jobs. I stepped closer to take it all in and suddenly something popped out in front of me. 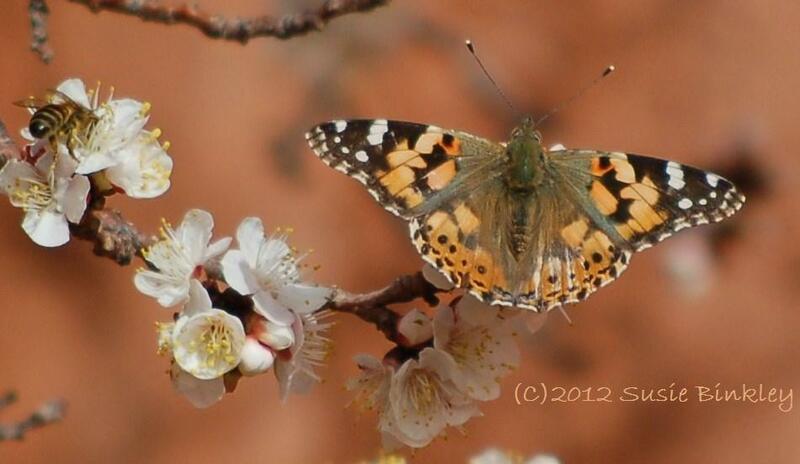 A painted lady butterfly landed on a blossom, I pulled my camera up and began shooting. Oblivious to the mass of striped stinging machines all around me, I leaned in and snapped, snapped, snapped away. Not a single bug bothered me. It was remarkable to be so close to them and stay so calm. But I felt comfortable. What I was feeling towards them was appreciation- for their beauty, for their pollinating services, for the privilege of being able to zoom in on their graceful activities. I stood there for twenty minutes taking pictures, but what was sad to me was that no passer-by ever stopped. They were too busy chatting or wrangling their kids or looking at the larger landscape scenery. I felt sad for what they missed. 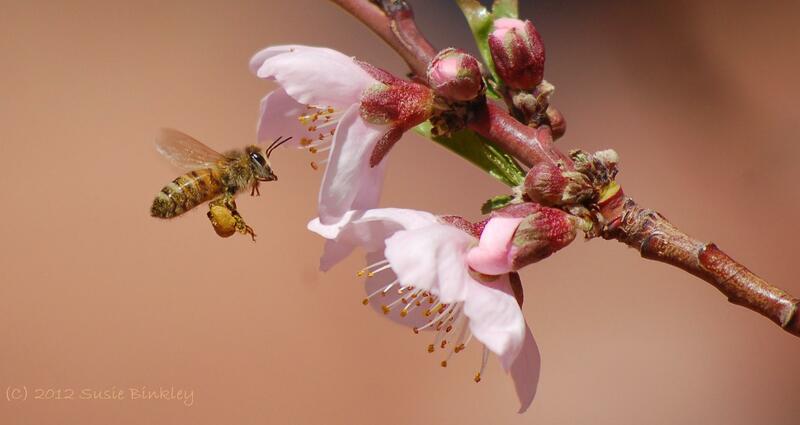 They missed the harmonious synchronicity of the bees dancing through the trees. 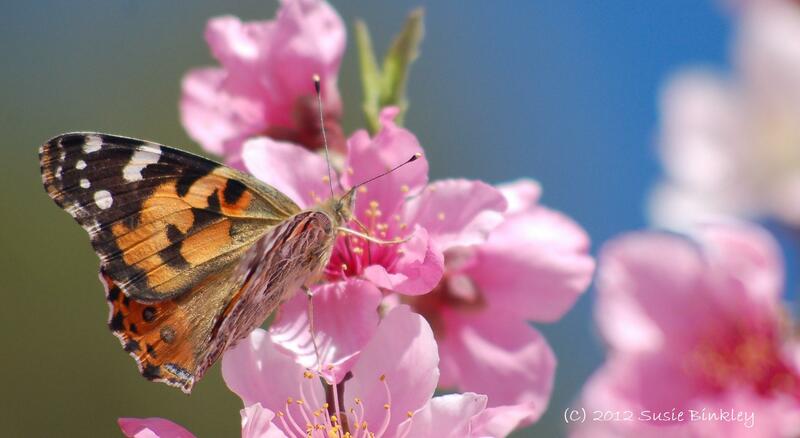 They missed the humorous ballet that bees and butterflies do when jostling for blossom positions. They missed the sticky sweet fragrance of spring intoxicating them with aliveness. They missed a smorgasbord for the senses, a buffet for the eyes, nose, and ears. They missed pink and white buds, golden orange bees and butterflies, and the bluest of skies blending perfectly with fragrance and buzz. Two days later, I was at the park hiking and doing photography with my twelve year old son. 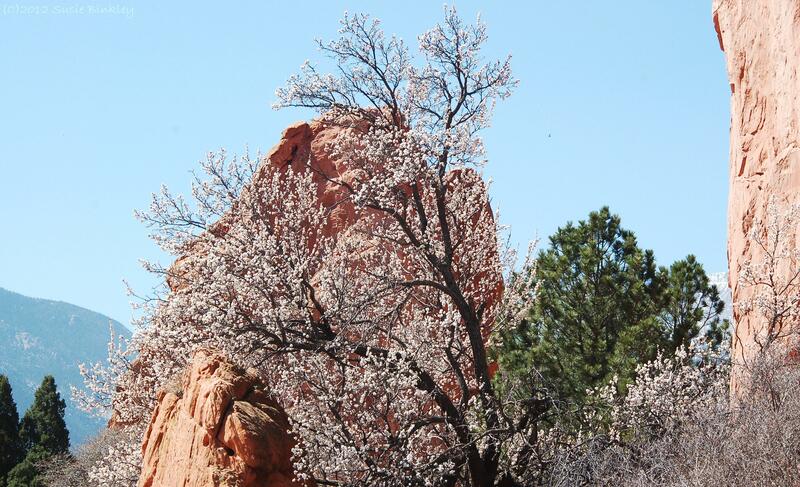 We went to a different flowering tree down on the south end of Garden of the Gods by Balanced Rock. Yep, there in the leaves was a little prairie lizard under the tree full of butterflies. The out-of-town tourist kids squealed when they saw it, prompting the scaly critter to run up the tree and hang inconspicuously from the bark. Good listening, son! 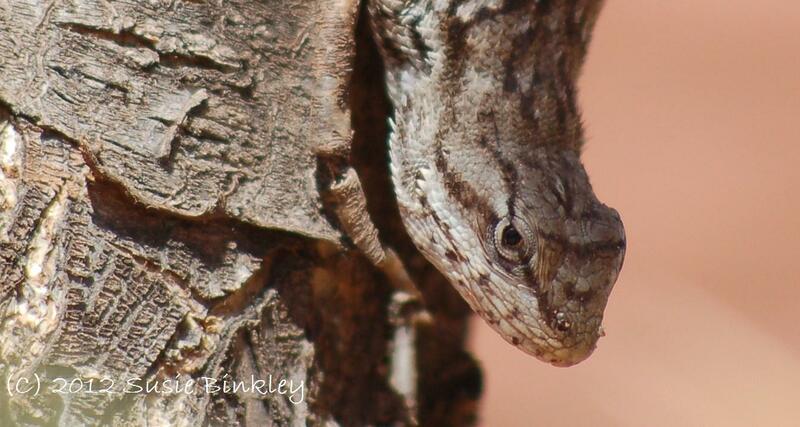 Now the photographers had two target subjects and the kids from out of town got to see their first wild lizard. 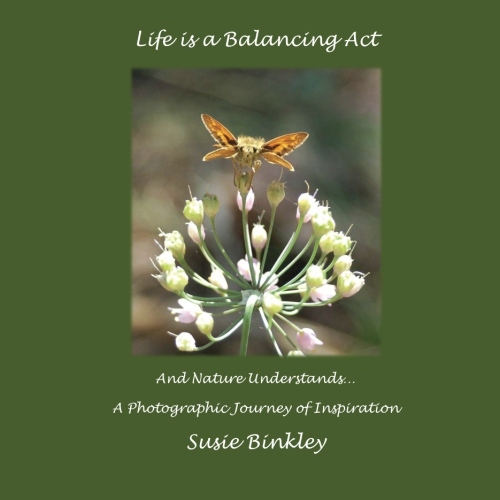 With these experiences I became acutely aware of why I ditch my ipod when I’m doing meditative nature photography. I want to take it all in, and feel the melodious blend of experience that all my senses together creates. Nature isn’t the same in one dimension or two. It takes all our senses to really get a feel for a place, to get the full richness of any experience. It still amazes me that on that first day, no one else noticed that the tree was smothered in bees and butterflies. 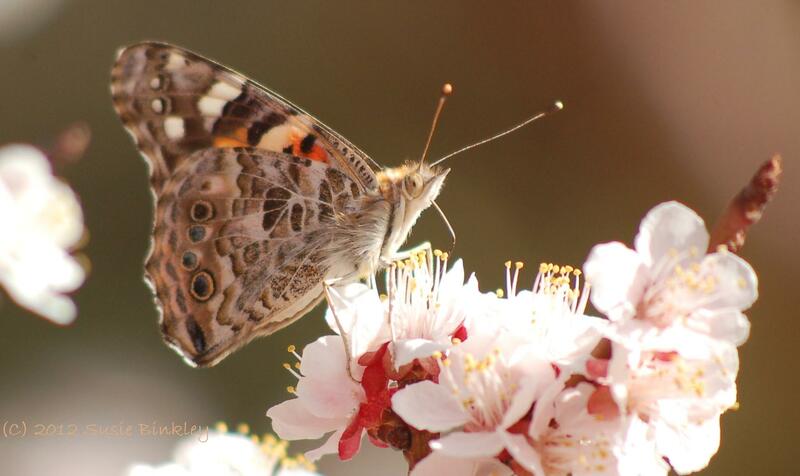 They never stopped to smell the luscious aroma, never spotted a painted lady. Poor people missed out. Because no one heard the buzz.